Not entirely true what you say here, BMW has a Navigator Street available which is around the same pricerange as the Garmin Zumo 3XX. As a matter of fact they share same hardware. Fits directly onto their own centered mount, just as any Garmin will fit this mount. 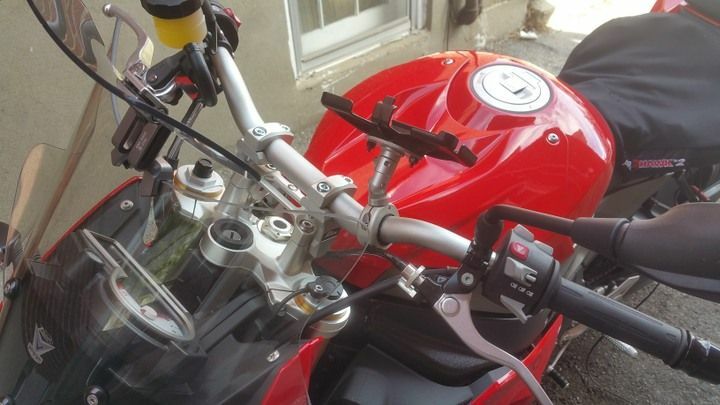 Here is my Garmin mount-- Techmount silver handlebar mount with RAM Garmin holder dedicated to each GPS. You may also notice the Rox risers. I have mine mounted in a similar location using RAM mount hardware. 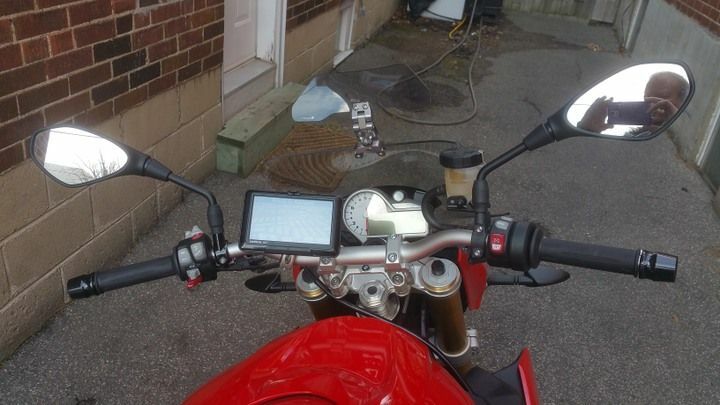 I replaced one of the handlebar bolts with a RAM ball, and then use a 3" extension to hold the Garmin cradle. I find this location very convenient and it doesn't interfere at all with my tank bag. Unfortunately it is not quite spring yet in Michigan (despite the calendar! ), so my bike is covered up and I can't take a picture at the moment. I saw some people had this concern. It does not happen with my Garmin Zumo 350. About 10 seconds after shutting the key off, the Garmin displays "external power lost, shutting off in <countdown> seconds". Then, once the countdown completes the Zumo shuts off. I then double-checked that there is no power at the Canbus port--even going so far as to check on the diagnostic connector under the pillion seat with an oscilloscope to make sure there was no Canbus power or traffic there. When I turn the key on again, the Garmin wakes up just like if I had it on a pure ignition-switched hard wire. Obviously I haven't tested every GPS, but that's why BMW puts this connector there, and they run the BMW-branded Garmins from that port. I have the garmin 550 fitted to mine is that the easiest way to check ? not even fitted it on bike and tried it whats with this canbus problem? Short version: don't worry, put your GPS on, ride the bike. Long version: some people expressed a concern that plugging something into the OA port might result in an improper shutdown of some electronic modules on the CANbus, which could then lead to a drained battery. I have never heard any reports that this actually happens, but people are paranoid. For sure it doesn't happen with my GPS, and I would be very surprised to find that BMW screwed this up. I think it's an old wives tale. But if you're worried you can easily verify whether the power is shut off, just by watching your Garmin's display--if it says "external power lost" then the power is shut off! With more effort, you can verify whether any electronic modules are still talking on CANbus--you're on your own to figure out how (hint: you will need an oscilloscope or some other dedicated electronic test equipment, which most people will not have at home). The issue is when the ignition has been switched off with the power lead connected and without the SatNav in the cradle I believe. When switching off the ignition the cradle continues to draw power and keeps the CANbus live causing the battery to drain quickly. When the SatNav is in the cradle when the bike is switched off it works correctly, cutting power via the CANbus. No issues here on either a S1000R or K1300S. GPS on both (Garmin 660) is powered from the Canbus plug, turns on with the ignition, turns off about 60 seconds after turning off the ignition. This is exactly how "old wives tales" propagate..."I heard from a guy that there might be a problem...but another guy says exactly the opposite"
That's why I did a test. For sure I can't report on all possible configurations, but I did share results on one specific configuration. Maybe others could try other configurations and in the end we could finally put this concern to rest with actual data. I can also confirm that I did not see any issue with the GPS out of the cradle either. It would be very surprising to me if the OA connector--designed to support GPS installation--has such a fundamental design flaw. It's possible I guess--electronics are notoriously tricky--but seems highly unlikely to me. I would personally be really interested to hear any first-hand reports of problems!